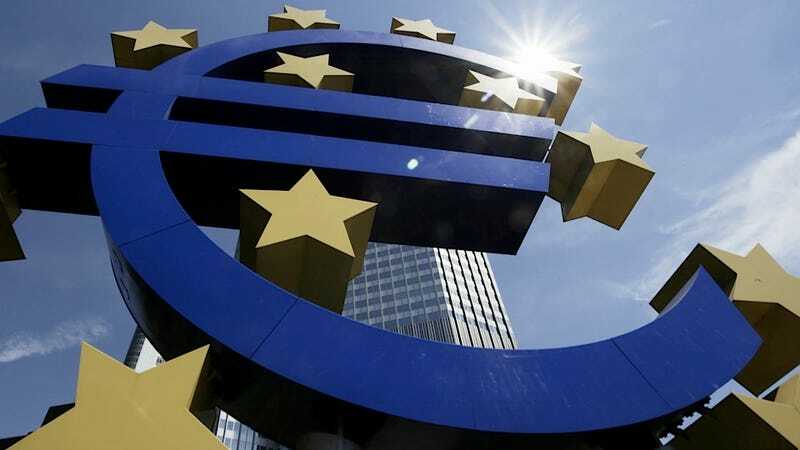 The European Parliament has delayed a hearing on a nominee to one of the overwrought European Central Bank's top posts in an effort to underscore the fact that there's a glaring absence of female leadership when it comes to the eurozone's monetary authority. According to the AP, Yves Mersch, the head of Luxemborg's central bank, was all set to put on his fanciest three-piece suit and appear before the European Parliament's economic and monetary committee last Monday to audition (step, turn, kick, turn) for a vacant spot on the ECB's board of six. Committee head Sharon Bowles, however, made it clear that, because she never received "an adequate answer" from eurozone finance ministers after asking them to nominate at least ONE woman for the ECB position, the committee would be delaying Mersch's nomination. There is now not even a single woman sitting on the main board of what is one of the most powerful and essential institutions in the EU. The symbolic and practical effects of this absence are not without note. The letter Bowles sent to eurozone finance ministers asking for a lady nominee offered only "some verbal assurances that no women could be located" to nominate for the ECB opening, and the letter's call to advance more women to influential positions within the ECB went entirely unanswered. No women, notes the AP, sit on the executive board that runs the central bank's day-to-day operations, nor do any women sit on on the 23-member governing council that sets interest rates. Since its founding in 1998, the ECB has had only one woman on its board — Gertrude Tumpel-Gugerell, who recently left in May 2011.